Horse show tensions can peak in the warm-up area, causing flared tempers and risky situations. If everyone follows a few basic strategies and common courtesies, it can be a much kinder, safer place to prepare for competition. Horse show tensions can peak in the warm-up area. Unpredictable, sensitive horses and their humans, amped up on caffeine, nerves, and excitement, working in an often loud and overcrowded spot, is a perfect recipe for heated tempers and risky situations. But if everyone followed a few basic strategies and common courtesies – or etiquette, which the Oxford Dictionary defines as “the customary code of polite behaviour in society or among members of a particular profession or group” – the warm-up ring would be a much nicer, safer place to prepare for competition. In addition to stressing the fundamentals, Seyfort, who incorporates mental training into her instruction, also likes to simulate the chaos of the warm-up ring at home to prepare her students for what they might face in the real-world show environment. Rehearsing benefits horses, too. The warm-up isn’t the place to deal with training issues. 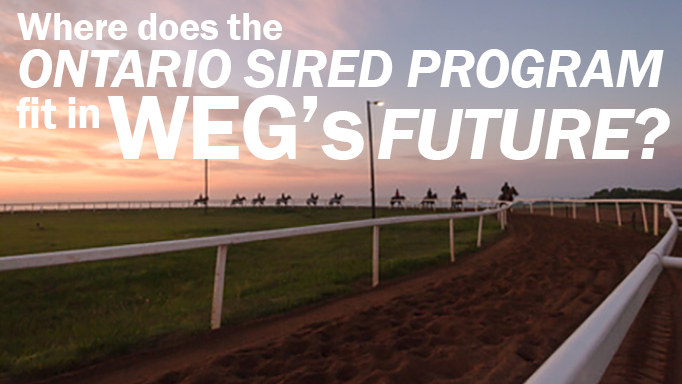 “The more practice at home and during outings, the more confident the horse will be at shows,” says Seyfort. Although at-home preparation provides a framework for competitors to follow at a show, the warm-up will usually pose some challenges, such as a horse in meltdown mode or other riders unaware of (or ignoring) ring etiquette. Nevertheless, riders must be aware of everything that’s happening, looking up, well ahead and peripherally, plus knowing what’s going on behind them. It’s like riding in an imaginary safety bubble that separates them from the other competitors. Defensive driving is defined by the Ontario Safety League as “controlling a vehicle so as to prevent/avoid collisions despite the (unsafe) actions of others and the surrounding (adverse) conditions.” Riders in the warm-up also need to practice defensive riding. “Use your self-preservation, some common sense,” says Conrad. That means if a horse or rider’s safety is threatened, they should leave the ring until the situation is diffused. Likewise, if a rider’s own horse is unmanageable, they should take it upon themselves to exit. And, harkening back to the driving metaphor: don’t text and ride. A mounted rider using their cell phone isn’t being mindful of their surroundings, even if they think they are. 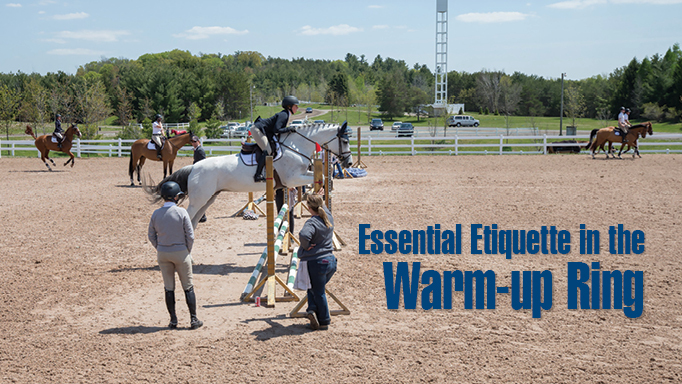 Just like any other set of rules, those of warm-up etiquette are occasionally broken, and that’s okay. Clear communication, and apologies if needed, go a long way to maintaining equestrian harmony and keeping the circus atmosphere at bay. A show’s most hazardous and stressful location is often the in-gate. • Only the next competitor and their coach should stand at the gate (other than show personnel) – no extraneous people or pets. • Exiting riders should keep moving without stopping to debrief with their coach. • Keep a buffer area of at least six metres around the gate. Seyfort also wants to remind competitors that the in-gate person is essential to maintaining a smoothly-running show and is a rider’s ally. She suggests competitors introduce themselves and maintain communication about class scratches, adds, or unexpected circumstances such as a pulled shoe that could require a change in the order of go. Pay heed to their instructions, always be on time, and be pleasant. “The gate person is going to help you a lot more if you’ve been polite to them,” says Seyfort. Go with the flow: try to ride in the same direction as others. If that’s not possible, when approaching another rider in the opposite direction, always pass left to left. FUN FACT: right to right in EU! Leave ample room when passing and only overtake on the inside. Leave at least one-horse length between you and the horse ahead. Yield the track to faster-moving horses. Don’t stop on the rail. Find a quiet spot in the middle of the ring or better yet, leave the arena. Jumpers have the right of way. Don’t park or cross in front of or behind a jump. If a rider falls off, halt immediately. Dismount if the horse is loose. Keep your whip flat against your side. Use it and voice commands subtly so as not to upset other riders’ horses. Pay attention to warning tail ribbons: red = kicker; green = young/inexperienced; yellow or blue = stallion. 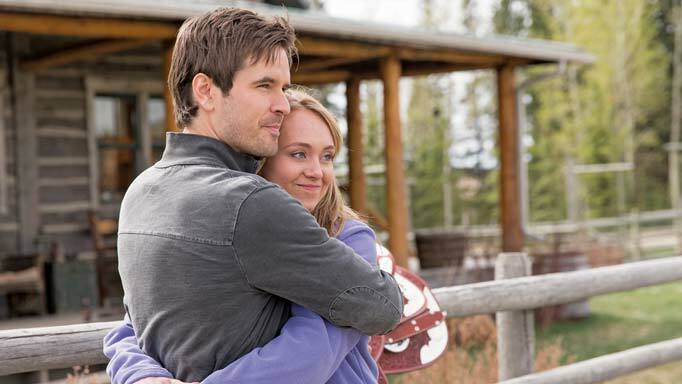 Go behind the scenes and get the scoop on season eight of CBC's hit show, Heartland. 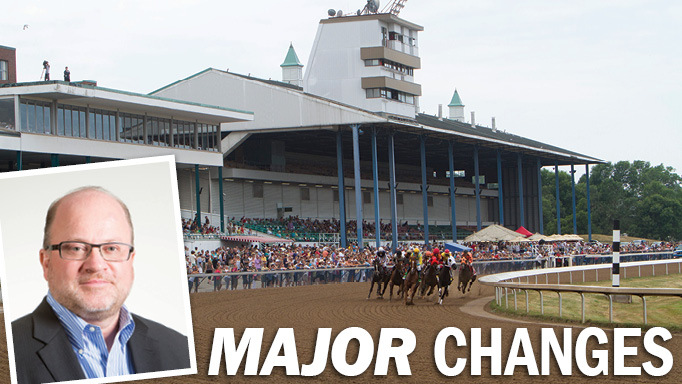 Humour columnist Doug Breen prepares lessons plans for his imaginary Equine Immersion school.